Ten Feet Off Beale: Texas, Y'all! We've officially hit the road to TEXAS!! I am so excited buttttt I still have a ten hour car ride to and from Austin. That part isn't so fun. We've stocked up on snacks, music, and games so we should be good to go! I hope you all have an amazing weekend! I'm sure I'll be spending alot of time on twitter (hello, ten hours) andddd I'm sure I'll be posting to Instagram. If you aren't following me there, what is wrong with you you should! Ps. Happy actually Birthday, Anthony!! Have a great trip! Roadtrips can drive you a little crazy (ten hours?!) but they are so much fun!!! Jealous! I'm off to the beach this weekend, but my three hour trip doesn't even compare :) Happy weekend, girl! 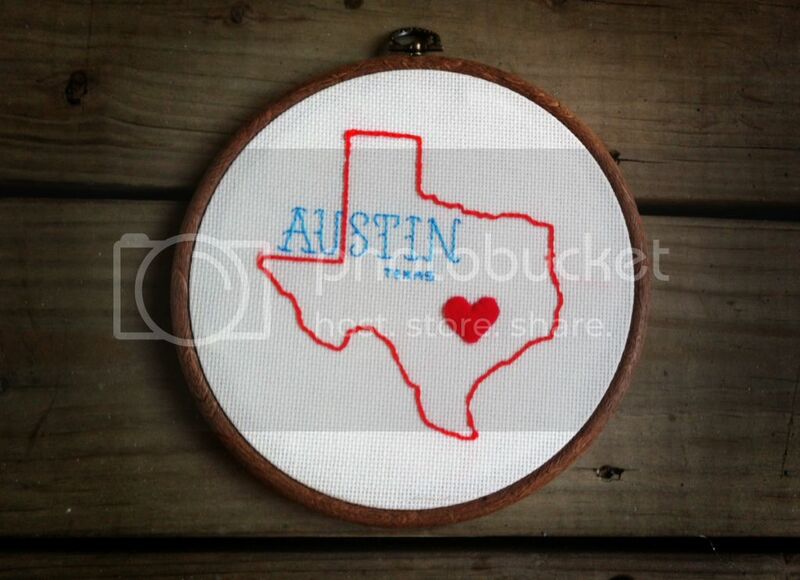 Love this hoop art! I've been wanting to do state specific ones for awhile now. Can't wait to see more of your Texas pictures! Enjoyed checking out your blog! New follower~ hope to get a follow back.